European stocks rebounded from an early slide this morning, even after U.S. President Donald Trump threatened fresh tariffs on $11bn-worth of imports from the continent on Monday. Ironically, futures on the , and NASDAQ 100pointed downwards, in a sign that investors feared the consequences of opening a new trade war front. 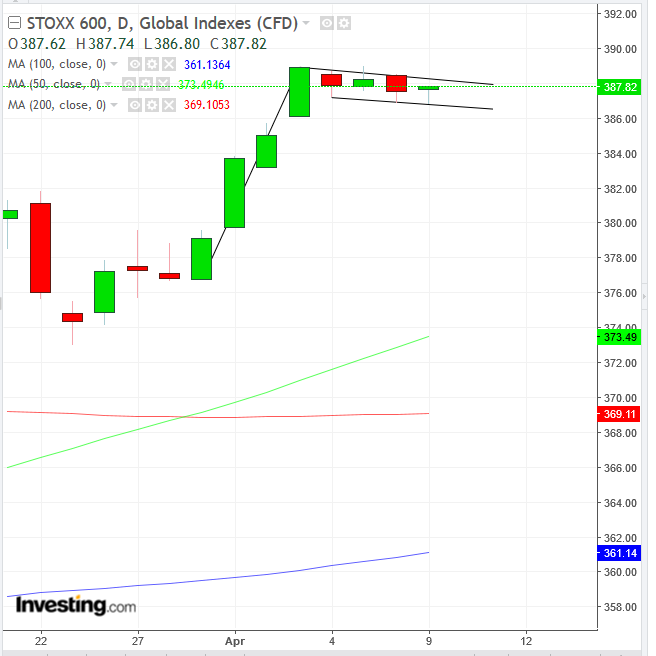 The STOXX Europe 600 returned to positive territory after being dragged lower by technology firms and household goods producers, which offset gains in healthcare shares in the early session. However, technically, the index may be trading within a falling flag pattern, bullish in the uptrend this month. The European Commission was reported to be ready to go ahead with its own trade tariff retaliation after the Trump administration re-ignited a 15-year long dispute over aircraft subsidies by announcing new tariffs on a extended list of European goods, to “compensate” for an alleged competitive disadvantage for Boeing (NYSE:) (NYSE:BA) caused by allegedly unfair subsidies to its rival Airbus (PA:AIR). In the previous Asian session, local stocks were mixed. China’s gave up 0.16%, while Hong Kong’s added 0.27%. Japan’s climbed 0.19%, South Korea’s sealed a 0.13% advance and Australia’s S$P/ASX 200 eked out a 0.01% gain. On Monday, U.S. indices were mixed as a persistent trade impasse between the world’s two largest economies and what is expected to be a tough U.S. earnings season weighed on sentiment. The S&P 500 eked out a 0.1% climb, which was enough to extend a rally to its eight day—its longest winning streak since 2017. Energy (+0.44), a risk sector, tracked oil prices higher as Libyan military tensions spiralled. However, Consumer Staples(+0.41%), a defensive sector, posted a mirror gain, demonstrating that caution remains in markets. That wariness is reinforced by the overall paltry results of majors, as well as by yields hovering 20% below their November peak. Still, the bullish camp would point out that the SPX surged 3.23% in eight sessions, posting a golden cross, and currently challenges the September peak—standing only 1.26% away form it. Our question is whether disappointing corporate earnings—the heart and soul of fundamentals—will take the steam out of a rally that was powered by what we consider unconstrained greed. After last year’s extraordinary returns, companies are expected to report an almost 4% drop in earnings. Their executives will have to convince shareholders and investors that their stock holdings aren’t going downhill from here. When Trump’s trade rhetoric dominated headlines, we repeatedly warned that monetary policy is the key longer-term market driver. Now that the market seems to have re-focused on the Fed’s perceived accommodative shift, however, we’d be keen to remain vigilant over this turn—not because of renewed pressure on policymakers by the U.S. president, but because of the central bank’s own reasoning, which may continue shifting. In FX trading, the pound pared an advance after testing the 1.3100 level, but remained in positive territory ahead of a crucial meeting between U.K. Prime Minister Theresa May and EU leaders to evaluate the U.K.’s request for a second delay on Brexit deadlines. 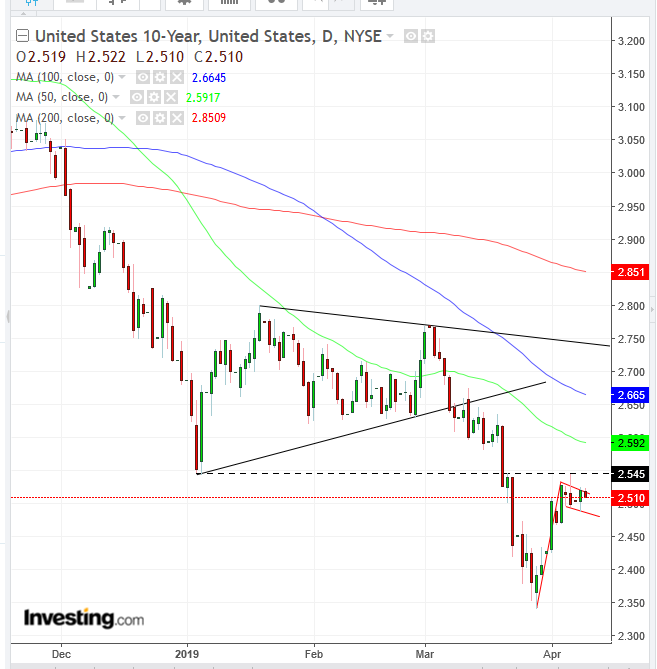 Yields on 10-year Treasurys and the dollar were downbeat this morning. We have been bullish on Treasurys since yields double-topped in October. Also, a continuation pattern in the first couple of months of the year reinforced the downtrend. However, the trading range since last week may be forming a falling flag—bullish following the jump this month—increasing the potential of a fuller return move to the symmetrical triangle since the start of the year. Higher yields—even if resulting from a correction—would likely prompt a temporary equity rally. 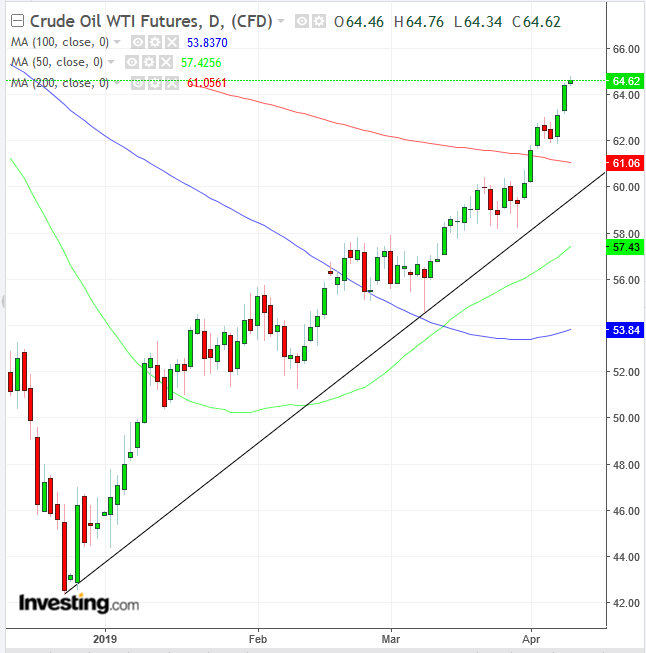 Crude built on a five-month high as the escalating political crisis in OPEC oil-producer Libya overshadowed an increase in U.S. rigs—which would normally be a catalyst for a selloff. Technically, bulls will have to make their case, as the price nears the $65 level—the lows of June-August last year. Meanwhile, Saudi Aramco, the world’s largest oil company, has received $75 billion in orders for its debut bond sale on Monday, with yields on the offering likely to fall in line with or below Saudi Arabia’s sovereign debt. The Bloomberg Commodity Index increased less than 0.05%, reaching the highest in more than four months on its seventh straight advance. declined 0.2% to $70.96 a barrel, the largest drop in more than a week. LME advanced 0.7% to $6,521.50 per metric ton, the highest in about nine months. Gold climbed less than 0.05% to $1,297.90 an ounce, the highest in almost two weeks.